Our ancestor Gillis Jans De Mandeville (b. 1626) migrated to America and was a 2nd great-grandfather of Margareta Van Dyke Van Voorhees (a great-grandmother of our Margaret Williamson McCreary). Gillis’ grandfather Dr. Michael Jans De Mandeville spent much of his life in Nijmegen, and may have had some close encounters with some Schenck Van Nydeggen people. Michael’s Huguenot (French Calvinist) ancestors reportedly came from France. Nijmegen city hall. Dr. Michael De Mandeville was on the city council in 1618. Harness of Sir Maarten Schenck Van Nydeggen reportedly hangs in chambers. Michael De Mandeville married Maria Van De Raede (b. Antwerp) on June 13, 1601 and their son (our ancestor) Johann "Jan" Michaelsz De Mandeville was born in Nijmegen soon afterwards. That was about a dozen years after the death at Nijmegen of Sir Maarten Schenck Van Nydeggen. In 1601, the Dutch Wars of Independence from Spain were continuing, with a truce of a few years still some time away (1609), and General Pieter Schenck Van Nydeggen was in his final years of life, somewhere. My guide at Doesburg, Gelderland, suggested looking further south for Schenck Van Nydeggen. Dr. Michael De Mandeville became City Physician of Nijmegen, and was prominent in civic events. He would have been a frequent visitor to the city hall (he was on the city council in 1618), where it is reported that the military harness of Sir Maarten Schenck Van Nydeggen hangs. The city hall was locked up when Lara and Gary were in Nijmegen. Michael taught at the Latin School (still standing, pictured below) in Nijmegen. In 1607, Michael was asked to resign as principal at the Latin School in order to devote full time to the practice of medicine. Latin School at Nijmegen. Dr. Michael De Mandeville taught here. Latin School of 1544, Nijmegen. 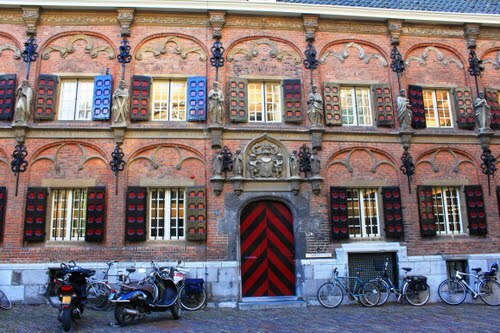 No doubt Michael and his physician descendants visited the hospital (now a restaurant) at the Commanderie of St. Jan. This was founded in the 13th Century as a shelter for pilgrims headed for the Middle East. Commanderie van St. Jan, Nijmegen. A former hospital no doubt visited by at least 3 generations of De Mandeville physicians. Michael and Maria had many kids. I had thought that they might have been associated with St. Steven’s Church in Nijmegen (http://gelderlandchurches.tripod.com/nijmegensteven.html ), but a guide said “no”. This was the same guide who told me “maybe” about the purported grave in that church of Sir Maarten Schenck Van Nydeggen. I wonder about the relationships between the Dutch Reformed and Huguenot (Calvinist) congregations in Nijmegen in those days. 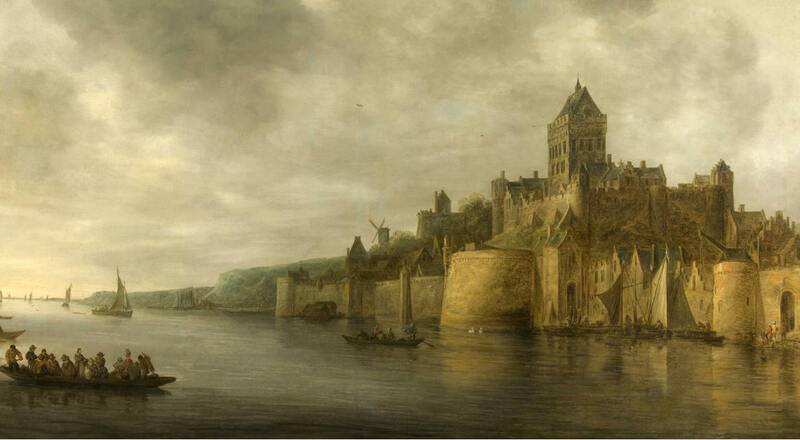 In 1623, Nijmegen denied citizenship to any Catholics moving into the city. “…within a span of three decades five of the largest towns of the central and eastern areas of the Republic had deprived their Catholic population of the right to participate in the community on a par with the Calvinists.” (page 163, “Calvinism and Religious Toleration in the Dutch Golden Age”). Lara at tulip fields north of Leiden, where ancestor Rev. Jan De Mandeville studied theology. On March 3, 1623, Johannes “Jan” Michaelsz de Mandeville entered Leiden University, and studied theology. He probably had had some earlier education elsewhere. Rembrandt Van Rijn lived in Leiden then. Leiden was then a center for cultivation of tulips. Lara and Gary saw tulips aplenty just north of Leiden in April 2012. In 1624, Johannes “Jan” Michaelsz de Mandeville lectured on the Hebrew language at the Atheneum at Harderwijk, Gelderland. He was married in Harderwijk the next year, according to the Gelderland Archives. This is contrary to what many family trees say, which is Garderen. Jan married Trintgen Wilms on April 24, 1625, at Harderwijk. A son of Jan and Trintgen was Gillis Jans De Mandeville, the ancestor of the American De Mandeville people. Gillis was baptized in June 1626 at Doesburg, according to the Gelderland Archives; a witness was Gillis’ grandpa Michael of Nijmegen. It is not clear where Jan, Trintgen, and little Gillis lived then. Gillis was probably named after his uncle Aegidius (Gillis) De Mandeville, who in turn was named after Aegedius Radaeus Van De Raede (father of Maria, who was Gillis’ grandmother). Martinikerk in Doesburg, Gelderland. Baptism location of Gillis De Mandeville, son of Jan and grandson of Michael (a witness at the 1626 baptism). Doesburg on the River Ijssel. De Mandeville, Schenck, and Scherpenzeel associations. In 1628, Rev. Johannes “Jan” Michaelsz de Mandeville was appointed candidate minister at the Reformed Church at Kootwijk (west of Apeldoorn and southeast of Harderwijk; near Garderen). Meanwhile, Jan’s brother Emmanuel was studying medicine at Leiden. Church at Kootwijk, Gelderland. Rev. Jan De Mandeville preached here in 1628. I really liked cozy Kootwijk village, set in the woods. Jan became minister at nearby Garderen in 1630. He lived at Garderen until his death in 1657. An illegible stone in the church cemetery is thought to be Jan’s. My visit to Garderen was cut short by a downpour and a need to deal with end-of-day motorway traffic heading back towards my base at Huizen. Church at Garderen, Gelderland. Rev. Jan De Mandeville preached here for much of his life and was probably buried here. Nijmegen of 1641. Dr. Michael De Mandeville was one of 6,000 people who died of plague here in 1635. Perhaps shortly after this time Jan’s son Gillis married Elsie Hendricks at Garderen. Their home was at Voorthuizen village, near Garderen. Jan died in 1657. Gillis’ family left for America in 1659 aboard the ship “De Trouw” (Faith). His daughter Tryntje Gillis De Mandeville later in America married Cornelius Janse Vanderveer. Gillis De Mandeville reportedly became a friend of Gov. 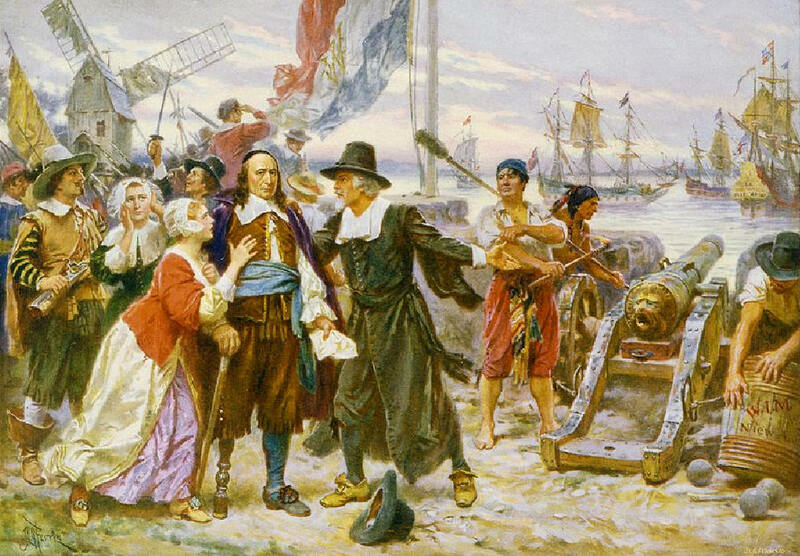 Peter Stuyvesant, who had to surrender New Netherland to England in 1664. Citizens urging Governor Peter Stuyvesant (friend of Gillis De Mandeville) to not fire on the English. 1664 Fall of New Netherland, from Wikipedia. Hi there. Interested to read your story. I too am descended from Johannes de Mandeville through his son Yellis (Gilles. We have some very interesting forebears. I live in Sydney, Australia; if you'd like to communicate, my email address is partog@bigpond.net.au. I am also a descendant of Johannes De Mandeville through his son Yellis (Gilles). I live in Indiana. Great Blog! Very Interesting! Thanks for the info. I am also a descendent. I am a twice descendant of Tryntje De Mandeville and her forefathers. Thanks for your blog. Does anyone know heritage in Normandy, France with our family? I am not familiar with De Mandeville history in France. I don’t know if, or how, the various De Mandeville lines might be related. If several people with De Mandeville ancestries were to test their autosomal DNA, esp. Family Finder at Family Tree DNA, & send the results to www.gedmatch.com we might be able to detect faint traces of these ancestries on specific chromosomes. Also, any Mandeville-surnamed male could test yDNA, doing at least the 67 STR markers level. In 2007 there was an attempt to collect De Mandeville yDNA samples from descendants of various lines, but the project does not appear to have developed. Nevertheless, new Mandeville yDNA samples should yield helpful matches in the FTDNA database. There is reportedly a yDNA sample on file from a male-line descendant of David Gillis De Mandeville (b. 1670) of the Netherlands line. A yDNA sample from a France-England line of De Mandeville would make short work of the question of relatedness. Some yDNA linkage has been reported between Mandeville in Scotland & a line of St. Clair/Sinclair. Very interesting story. I've only discovered recently to be a descendant of the Dutch de Mandeville's. Whereas the USA branch exclusively stems from Aegidius (Yelis) my roots come from his brother Wilhelmus (found in your familyhistory as William). It is, however, most unfortunate that all records relating to his birtb, baptism and marriage have been destroyed at Voorthuizen where he lived. This stems from his name being mentioned at fhd birth and marriage of his son David, Voorthuizen at about 1682 and his marriage on March, 24gh, 1703. This David procured a son Nicolaas (Klaas in Dutch), Voorthuizen, April, 27th, 1710. He married January, 8th 1747 Meelisje Wulfen. Their daughter was born as Geertjen Claassen Manderil (quite different from grandfather's and greatgrandfather's name). She married a Johannes van der Klok, their daughter was Dirkje Johanesse van der Klok bijgenaamd (alias) Reiser. She was my greatgrandmother's mother. I stumbled by chance into the Mandeville familytree. I have been exploring it finding all records at ghe archives mentioned here. Discovered Johannes 'a Mandeville having studied at Leiden as well as at Cambridge (UK) [Gonville and Cajus] as well as his cousin Bernard, ghs famous author of the Beehive. For the moment I am researching the Mandeville roots in France, most likely Rouen (Normandy), but I have not bdcome the wiser. Thank you for your information...I seen Johannes in Ireland & Dr. Bernard in England...I linked Bernard to Holland....Geoffrey de mandeville who was 1 of King William's commanders in his army in 1066 with the invasion of England was thought to be from Dieppe, Normandy....which is closer to Belgium & Holland...and yes Rouen was King William's home before England so much history there!! My direct line are very tall..is your's as well? Thats the Scandanavian in us Im sure! Hello, Karen. I have spent the last 30 years on and off researching the mandeville name. sometimes frustrating , but always rewarding. I will say that I think the link between France and La. etc, and the families from the Netherlands area are connected between 1500-1600. I haven't been able to get this last little bit of info . getting close tho. I have traced my surname (Mandeville) into the 900's A.D. and my maternal lineage to 243 A.D. Thank you this was a fascinating illustrated story of our common ancestor. I am doing something similar, but your depth of pictures is outstanding. Thanks for sharing.